UTICA – On Thursday November 12th, the lights in the classroom of the Cornerstone Community Church were turned on a little before 7 PM. This night of the week is usually reserved for meetings of the Mohawk Valley Freedom School, one of several community action groups that the church allows to use its space. This class, however, wasn’t about the civil rights movement or Black Lives Matter. There was no documentary to be shown about Angela Davis or “disaster capitalism. No presentations given on Ban the Box, feminism or Utica’s lead epidemic. It wasn’t really a “class” at all; it was a roll-call. As people filed in, and as those already seated got up to help retrieve extra chairs, the seeds of a coaltion had begun to sprout. 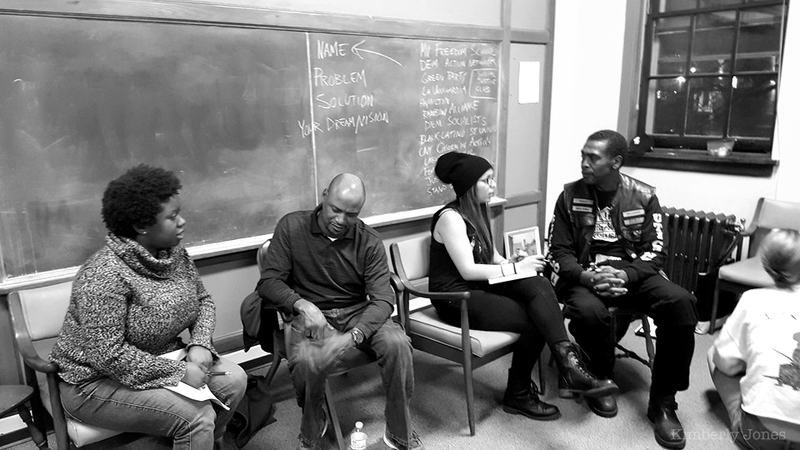 This was to be a meeting organized for the sole purpose of identifying groups and individuals in the Utica area attempting to do great things, and allow them to make connections with others who seek similar changes. Around 20-25 individuals showed up to participate in this meeting of like minds, but they were affiliated or in contact with a throng of area groups and organizations like the Hamilton (College) Democratic Socialists, the Democratic Action Network, CNY Citizens in Action, Stand Up and Speak Out, Justice or Else, Black Rose Anarchist Federation, the Oneida-Herkimer Green Party, Hamilton (College) Rainbow Alliance, Feminists of Color, several Black and Latino student unions from nearby colleges and the Love and Rage Media Collective. The number of attendees may not seem impressive to some, but the networks of the represented groups extends well beyond those in attendance. Indeed, the evening was a major step in the building of solidarity between local activists, the purpose being that there are far too many things being attempted that could use some help, some press, some extra minds. The evening was broken up into introductions of who’s who and what they consider to be economic, social and racial problems in the area. Of deepest concern were instances of racism on local college campuses (coinciding with a nation-wide wake up call at institutions of higher learning), the segregated approach to Utica’s “revitalization”, chemical “bomb trains” which carry crude through the area, cooperative business models, Ban the Box and the need for a community center for social activist functions. Hoping to expand upon the initial meeting, the group plans to meet again in the next month to discuss further direct action campaigns and strategies for wider support.